EIGHT-hundred Newton-Metres. 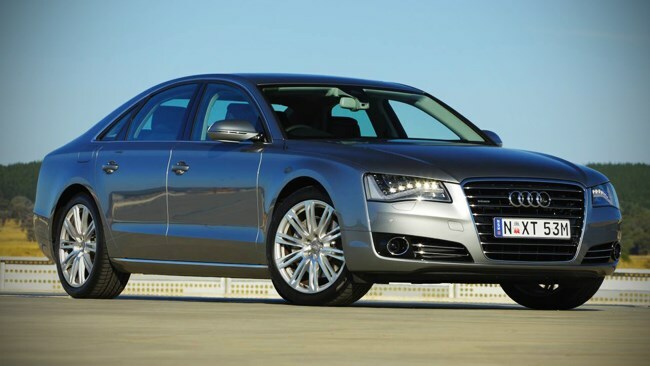 It takes a lot longer to say it than to feel its full-bore rush when you stomp on the turbo-diesel version of Audi’s A8 limo. Audi claims a believable 5.5sec 0-100km/h. I haven’t driven the FSI petrol A8 launched here last year, well ahead of the diesel versions – this one and a 3.0-litre TDI. But to my mind, the (0.2sec slower) FSI will have to be pretty damn good to come anywhere near the total package offered by the 4.2 TDI. Given the poor take-up rate on luxury diesels here, I have to wonder if Audi chose to court early adopters by launching the FSI first, knowing the 4.2 TDI is a superior engine. Either way, having spent the Easter weekend swanning regally round town and urbs in this car, classical music wafting from its 14-speaker Bose Surround Sound system, I’m feeling thoroughly chilled and spoiled. Let’s just say this is a fine conveyance indeed. Even if you have to do the driving yourself. Purring, clatter-free 4.2-litre turbo-diesel V8, eight-speed torque converter auto with sporting paddleshifts. Leather and timber, typically Audi interior with, I’ve just learned from the press release, three switchable ambient lighting modes. Four-zone auto air-con with, I discovered in the office carpark this morning, individual adjustment on the hefty fold-down centre armrest. Damn it. I need to return to the bosom of this car right now. I’m going to march into editor Bill’s office and demand the rest of the day off; for research purposes, you understand. There are ambient lighting modes to be explored. More driving to be done. And nuances in Beethoven’s Sixth to be savoured.